The shipping industry is the backbone of international trade. It moves 90% of the total tonnage of the world's traded goods – a massive footprint that translates into a significant environmental impact. The industry is responsible for 1bn tonnes of greenhouse gas emissions per year and this isn't expected to drop off any time soon. Despite IMO efforts like the new sulphur oxide (SOx) cap, effective January 2020, greenhouse gas emissions from shipping could increase by 50%-250% by 2050. In order to avoid such a fallout shipowners will need to be proactive and shoulder some individual responsibility. But this goes beyond air pollution. Role players wishing to reverse the negative environmental effects of the shipping industry will need to consider the broader picture. In doing so, there are five basic ways in which shipowners can make a difference. None of these is simple to implement - there are no simple decisions in the financially weighty world of international shipping – but they are clear and viable. All shipowners are already preparing for January 2020 and the new IMO sulphur emissions cap. Some shipowners are fitting marine scrubbers, others are converting to LNG propulsion, and the majority are choosing not to change anything, instead preparing to move over to low sulphur fuel oil (LSFO) at the start of next year. Most shipowners are basing their 2020 compliance decisions on economic cost, but what of the environmental cost? It’s not small. The heavy fuel oil used in international shipping contains on average 2700 times more sulphur than road fuel. Yet, research suggests that ships with scrubbers have the potential to produce even cleaner air than those burning LSFO. Of course, scrubbing systems produce washwater that needs to be disposed of in some way. With open loop scrubbers this is normally done at sea – raising major questions about environmental damage – while in closed loop or hybrid systems that disposal needs to be done at dedicated port facilities. But recent research has indicated that open loop scrubber effluent complies with the discharge concentration standards used by IMO, and even with the standards used by shoreside water quality regulators in Europe - including EU limits for inland surface water. 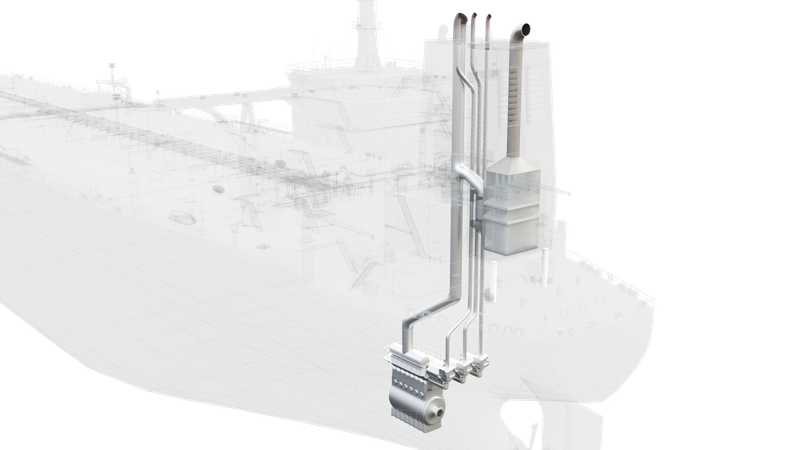 Gas scrubbers are slowly emerging as an environmentally friendly and cost-effective way to comply with IMO 2020. Though radically lower in SOx emissions, LSFO is certainly not a magic bullet. A paper published in the scientific journal Nature Communications suggests that the IMO's 2020 sulphur reductions would still see LSFO accounting for approximately 250,000 deaths and 6.4 million childhood asthma cases annually. Furthermore, the lower sulphur levels do not necessarily spell an overall environmental benefit. The same paper argues that these could, in fact, accelerate rather than slow global warming. Liquefied Natural Gas (LNG) is increasingly touted as the best environmental choice due to a significantly lower emissions profile than LSFO, but its high methane content calls its value into question, methane being 34 times stronger than CO2 at trapping heat over a 100-year period. Shipowners wanting to help the environment need to split their attention. In the short term they need to find fuels that satisfy economic objectives while doing the least harm. In the long term they need to find energy solutions that are more sustainable and environmentally-friendly. Beyond the IMO's target to cut 20% of CO2 emissions by 2020 is the objective of cutting 50% by 2050. This poses a massive long-term challenge to ship operators, but not just from a regulatory standpoint. Fossil fuel reserves are dwindling. It is in shipowners' interests to begin investigating cleaner fuel and power options. The history of the shipping industry was built on wind and it is time that the industry looks to return to renewable energy in a more technologically-efficient way. Potential renewable energy sources include wind, solar, biofuels, wave energy and supportive use of supercapacitors. Ships of all sizes can use renewable power for primary, hybrid and/or auxiliary propulsion. Due to its existence outside the public eye, and therefore the political and policy eye, the shipping industry has not seen the same level of attention on renewable energies as, say, the automotive industry. But the time is coming and shipowners who are already conversant in, or invested in, renewable energy sources will have the environmental and business upper hand. Inefficient route planning incurs huge amounts in unnecessary fuel spend, which costs the environment heavily in emissions. Shipowners regularly avoid low emission areas in order to avoid having to burn more expensive fuel, also leading to higher emissions. Popular shipping routes also lead to the deaths of mammals like whales and manatees in ship strikes. The North Atlantic right whale is the most cited example of this with the species reduced to the brink of extinction by ship collisions. However, as machine learning and AI become more advanced, owners have more and better options available. Technology will help them reroute intelligently and quickly, saving operational and environmental costs. It can also be used to map for recommended routes established by local authorities that guide ships around feeding grounds, mating grounds, and areas of regular activity for marine mammals. The shipping industry is a major cause of underwater noise pollution, mainly due to propeller cavitation. This negatively impacts marine species who rely on sound to navigate, feed and communicate. Research suggests that raising ambient ocean noise levels in the 20-300Hz range masks biological sounds, leading, among other things, to higher numbers of ship collisions among whales. Reductions in noise pollution are not only technologically feasible - they may also align with even greater vessel efficiency. The shipping industry is a major cause of underwater noise pollution, mainly due to propeller cavitation. Black water (wastewater from toilets and onboard medical facilities) and grey water (water from cleaning and ablutions) are marine toxic. They contain potentially damaging concentrations of bacteria, viruses and treatment chemicals, which threaten sensitive marine ecosystems and human life. Membrane bioreactor-like treatments can be used to reduce and better manage such waste. Though many vessels – cruise ships especially – use treatment technology to comply with strict black water regulations, ongoing development in this space is necessary. Solid waste includes all the glass, paper, cardboard, aluminium, plastic and other materials used on board as part of normal services. Traditional disposal (incineration, pulping or grinding before discharge overboard) is environmentally unsound. Operators need to more effectively manage solid waste through source reduction, waste minimisation and recycling. Though there are many ways in which shipowners can contribute positively to a healthier environment, the five areas above represent quick and big wins. And with technology evolving as rapidly as it is, operators needn't see profit and environmentally-friendly operational changes as a zero-sum game. We are increasingly seeing that the two can co-exist and complement each other. And all shipowners need to take action soon.